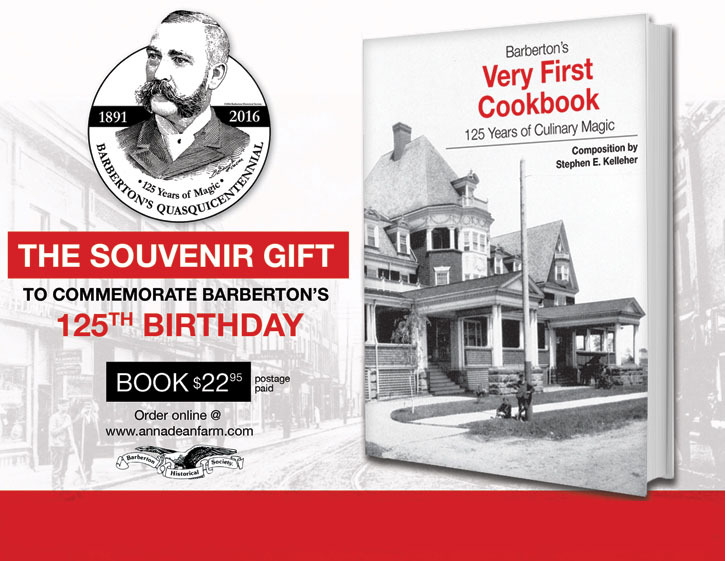 "Barberton’s First Cookbook – 125 Years of Culinary Magic"
In honor of the 125th Anniversary of the founding of Barberton in 1891 by Ohio C. Barber, the Barberton Historical Society proudly presents “Barberton’s First Cookbook – 125 Years of Culinary Magic.” This is surely the souvenir to buy and own to commemorate 125 years of Barberton’s history. This beautiful, new large format, glossy, hardbound book will be easy to read. It’s richly illustrated with some of the very best photos of the 1890s from early Barberton. The price is ONLY $22.95, postpaid. Order your copies NOW for only $22.95 each, which includes delivery, by sending your check to the Barberton Historical Society, P. O. Box 666, Barberton Ohio, 44023 or you may purchase on line at our gift shop and pay via credit card. All proceeds from the sales of our materials go to help restore the historic buildings in Barberton Ohio. Over the years the Barberton Historical Society have printed and sold 13 different books on various aspects of Barberton history. See our giftshop to order any of the few remaining Books, DVDs and Barberton collectables we have currenly available. Planning a wedding, the O. C. Barber Piggery offers a unique venue for your special day and other special events, too. Check availability at www.annadeanevents.com. It’s not too late for this year! 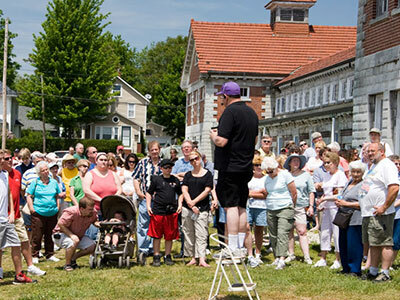 The Barberton Historical Society conducts a annual walking tour of O. C. Barber’s Anna Dean Farm. You can tour the interiors of the Pig Barn, Feed Barn, Barn No 1, Colt Barn. 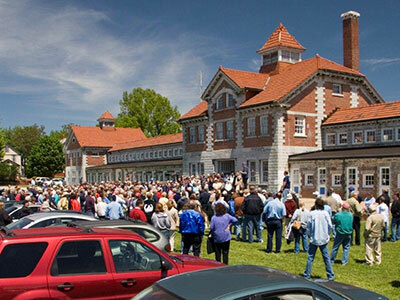 The tour is free and open to the general public and everyone is encouraged to come and bring your families and young children. If you are interested in helping or joining us please contact us at Barbertonhistsoc@aol.com. Have you ever looked at the Social networking site Facebook? Everyday we try to post something new on this site in the way of photos, and Barberton historical information. You can visit us by joining Facebook or just by clicking the icon above. "The Anna Dean Farm can give you what you need, all that you desire, and more than you deserve." Annadeanfarm.com is the website of the Barberton Historical Society and we will attempt to show you Ohio C. Barber's Anna Dean Farm. The view of this website is to show the Anna Dean Farm as it would look in 1915. Unfortunately today, only 8 of the original 35 Anna Dean Farm buildings survive. The Barberton Historical Society owns five of the remaining eight Anna Dean Farm buildings, which we are currently restoring. Please visit all of the buildings on the Anna Dean Farm, but why not start with the Mansion of O. C. Barber, which upon its completion in 1910, was considered to be the finest mansion between New York and Chicago. The first thing you will encounter on the site are the floor plans of the Mansion. To take a virtual tour of the Mansion you will only need to click on the individual room. The Barberton Historical Society is a non profit 501(c) 3 organization, so all of your donations are tax deductible. If you would like to help us our please visit our gift shop, or click on our DONATIONS button below which contains information on how you can make a tax deductible donation to help preserve the remaining Anna Dean Farm buildings. In the meantime to contact us to ask us any questions, you can reach us via e-mail at Barbertonhistsoc@aol.com or call us directly at 330-830-1444. We have over 3000 individual photos of the Anna Dean Farm and Barberton Ohio. However we are always looking for more. Please keep us in mind for any old photos of Barberton. © 2018 Barberton Historical Society. Anna Dean Farm™ is a registered Trademark of the Barberton Historical Society, all rights reserved.